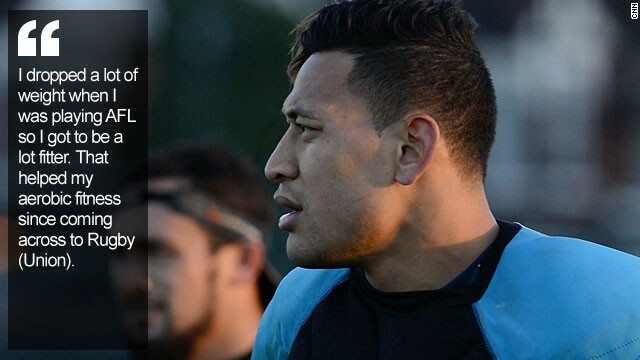 (CNN) -- In the twinkle of an eye, Israel Folau has accomplished what most athletes would be happy to achieve in an entire career -- and in his case he has done it in three sports. Since bursting onto the scene in 2007, the Australian has made his considerable presence felt in not one but three oval-ball codes, weighing in with match-winning performances in Rugby League, Aussie Rules football and, most recently, Rugby Union. Still only 25, Folau is now reaching his athletic peak and keen for the second half of his career to be just as successful as the first in which he has become a try scorer par excellence. 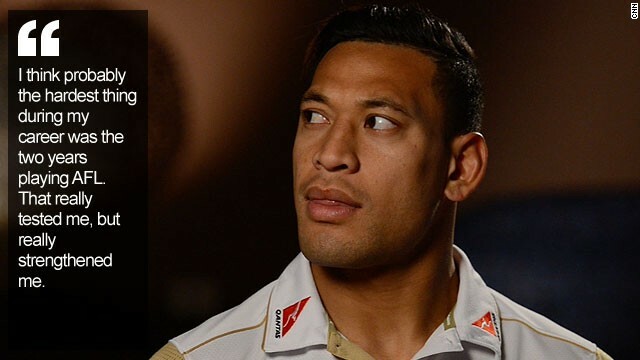 "Everything's going to plan, the way I would have liked it," Folau told CNN's Human to Hero series. "There's hopefully a long way to go in my career." 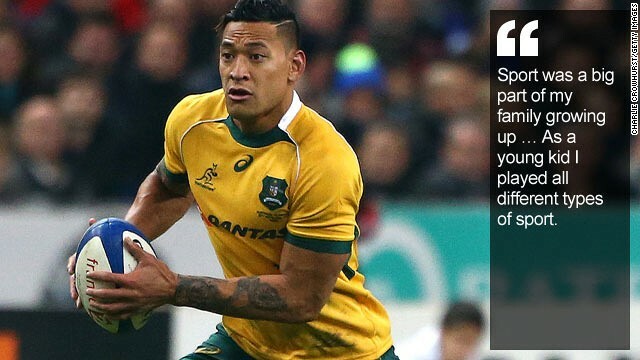 Affectionately known as "Izzy," Folau was born in the Sydney suburb of Minto to parents of Tongan descent. 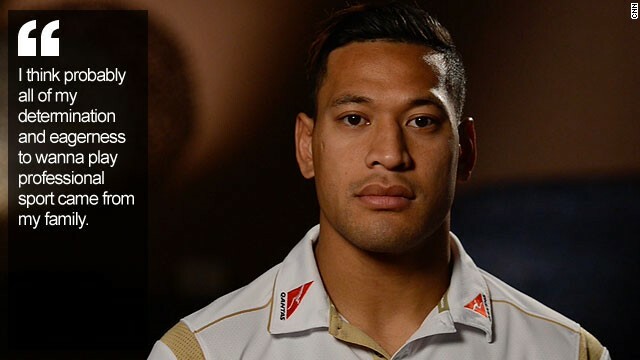 One of six siblings, Folau recalls being encouraged to participate in sports from an early age. "They were a very, very big part of my career growing up. I think probably all of my determination and eagerness to want to play professional sport came from my family." Folau began his professional Rugby League career at the age of 17, scoring a record 36 tries for Melbourne Storm in his rookie season. His raw talent earned him a call-up to the national squad becoming the youngest-ever player to represent the Kangeroos -- though his record of 18 years and 194 days was recently eclipsed by Sione Mata'utia. The following year, he rubber-stamped his status as an emerging star with a further 37 tries in 39 games, this time for the Brisbane Broncos. 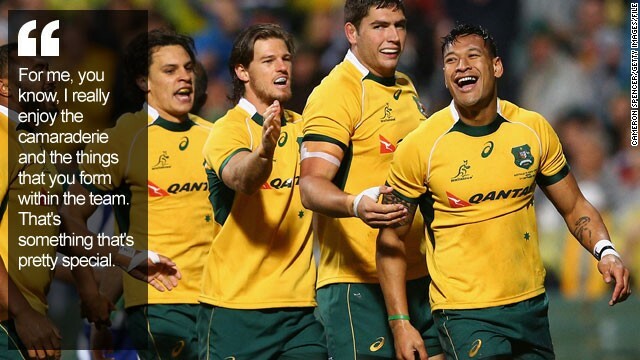 It was incredible start by any measure, but Folau took it all in his stride. "I probably realized when I was maybe 13 years of age that I could make a living out of playing professional sport and from that time on it was really a goal for me do that as soon as I can." Weighing in at just over 100 kg (220 lbs) and standing 1.95 m (6'5") tall, Folau is, like his childhood idol, former New Zealand winger Jonah Lomu, an intimidating physical presence on the pitch. A hefty frame allied to explosive turns of speed make Folau a real handful for opposition defenses. He is also incredibly agile for a big man, capable of salmon-like leaps to catch the high ball. "I get excited when the ball goes up in the air. I try to always get up there ... I get a buzz out of it. I am always trying to work at it." Having excelled at both club and international levels -- he scored six tries in eight appearances for the Kangeroos -- Folau inevitably attracted the attention of Rugby Union scouts. 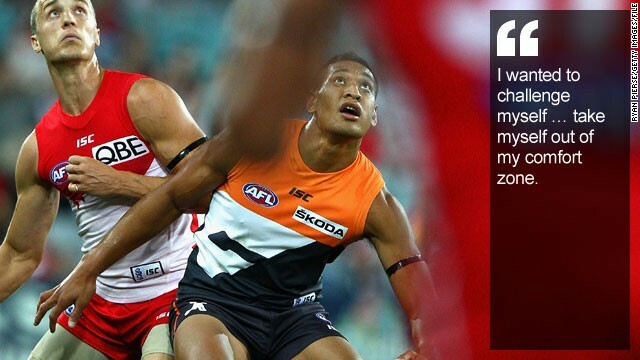 But rather than making what has become a routine switch between the 13 and 15-man codes, Folau opted to take a detour, signing for Australian Football League (AFL) side, the Greater Western Sydney Giants in 2011. "There are different reasons why I wanted to try AFL -- some of them family reasons and others were more personal ones," he explains of a route taken by only a handful of Australian Rugby League players in the past. "I wanted to challenge myself, you know, take myself out of my comfort zone." His two seasons in AFL didn't hit the heights reached in Rugby League but, as he has admitted in previous interviews, it was extremely rewarding financially. It wasn't just his bank balance that profited though, his all-round game did too, he says. "My time in AFL improved my kicking and, you know, I dropped a lot of weight when I was playing AFL, so I got to be a lot fitter. It has helped me a lot," he said. 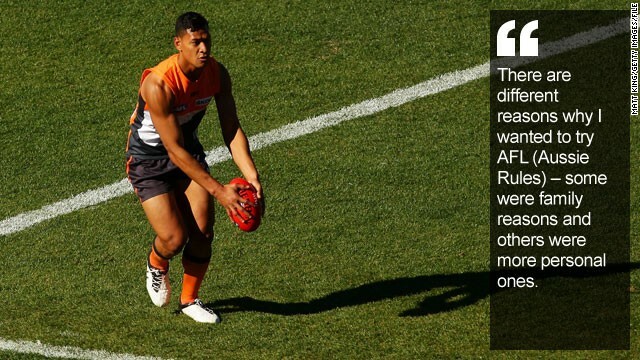 A comparatively quiet period in AFL exploded back into life when Folau signed for the Rugby Union side New South Wales Waratahs for the 2013 season. Cementing his place at fullback, Folau impressed with 20 tries in his debut season and he was drafted into the international squad to face the British and Irish Lions touring side. Folau's impact was immediate as he ran in two tries -- the second a sensational solo effort that lit up the Brisbane's Suncorp stadium -- earning him the Man of the Match award. Folau would end the year scoring a total of 10 international tries, equaling the Australian record for a season set by Lote Tuqiri in 2004. To date, he has scored 17 times in 29 appearances. Show-stopping cameos on the pitch have inevitably increased his profile off it, but Folau has remained focused, says former Australia coach, Ewen McKenzie. "Sometimes success can get in the way and people get confused, sidetracked and distracted, but he's just a very consistent operator," McKenzie told The New York Times in August. "He's difficult to contain. If you can get him in a one-on-one situation, he's going to get you a pretty good outcome. "He's a pretty big guy, he's got good skills, and he's pretty measured off the field. He's a very quiet, humble guy who is always smiling and laughing." After being voted Wallabies Rookie of the Year in 2013, Folau was honored again this year, winning the John Eales Medal -- an annual award given to the best Australian player of the year. Folau's talents seem to ensure that he will be singled out for some time to come, but it's being part of a team that he enjoys the most. "It's the best thing about it. You know, you get to enjoy the ups and downs together as a team, so you ride the emotions together. For me, I really enjoy the camaraderie and the things that you form within the team." With a World Cup in England to look forward to next year, Folau and his teammates will be aiming to win the William Webb Ellis trophy for a third time. 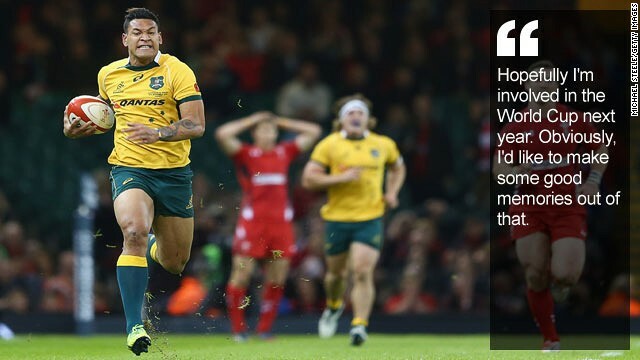 Given the Wallabies recent run of form -- a disappointing five-match tour of Europe in November yielded just two victories -- that looks unlikely, but whatever happens Folau won't be taking his foot off the gas as he looks to continue repaying the sporting debt owed to his family. "Coming to Australia from overseas to try and give us an opportunity to make something out of living in Australia was a huge thing for me so I wanted to probably give back a bit," he says. "In a way I wanted to work hard and play at a professional level to help them out. 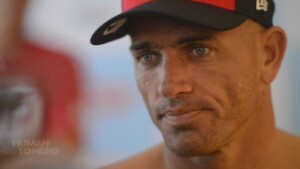 It's always been a key part of my success and always will be to the day of my retirement."